R1: Using the N Hook and holding one strand of Red Heart and one strand of Bernat together, ch16. Rs2-12: Ch1, turn. Sc in BL only of ea st. ASSEMBLY: Holding both pieces together, sc corresponding sts tog along each side and across bottom. Do not fasten off. R1: Sc in ea row end around top edge. Join with sl st in 1st sc. Do Not Turn. R2: (Ch3, sc in next st) around. HANDLE 1: Using the N Hook, make the first handle using one strand of Red Heart and one strand of Bernat together. Work a strand of Love Knots until the handle measures about 16" long. HANDLE 2: Using the G Hook, make the second handle using one strand of Bernat and one strand of Eyelash yarn together. Work chain stitches until the handle measures about 18" long. Attach ends of Handle 1 inside each side of purse. Attach one end of Handle 2 at the same place you attached Handle 1.
opposite side where you attached Handle 1. TRIM: Using Eyelash Yarn, sc evenly along both sides and along the bottom of the purse. 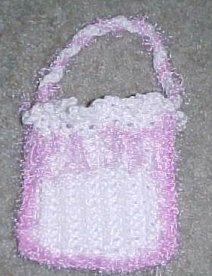 Cut 6" pieces of Eyelash Yarn for fringes along the top of the purse (see photo).